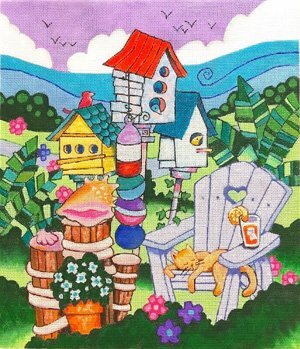 Seaside Resort needlepoint design by American artist Tate Nation shows a whimsical seaside town. It is offered by Purple Palm designs. This needlepoint canvas measures 12" x 14". The Seaside Resort design is handpainted onto 18 mesh mono needlepoint canvas. We recommend you use stretcher bars to hold the canvas taut. We recommend a pair of 16" and a pair of 18" stretcher bars and some thumb tacks.